If you use Windows Vista, you can control many features on your laptop from one window: the Windows Mobility Center. The Windows Mobility Center presents laptop users with a slate of common places to visit and things to adjust to help hone your laptop’s performance, as shown in the below figure. The Windows Vista laptop Mobility Center. 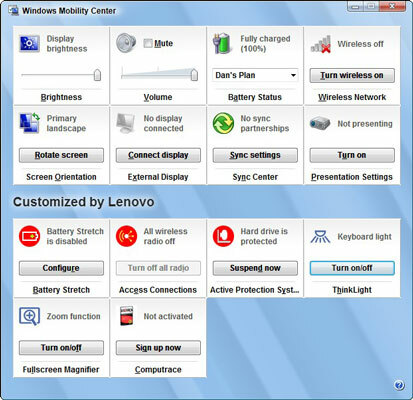 Through the Windows Mobility Center Control Panel icon, you can adjust the brightness and volume, check the battery status, turn your wireless network on and off, change external display settings, adjust sync settings, and control presentation settings. Note that the items shown can be adjusted from elsewhere, and many of the buttons simply display other Control Panel windows. But the Windows Mobility Center remains a handy place to know and visit for your laptop.